Hydrogen fuel cell-powered Honda FC Sport design study model shown at the 2008 Los Angeles Auto Show (November 19, 2008). The FC Sport emphasizes the design flexibility and potential of Honda’s V Flow fuel cell technology – already deployed in the Honda FCX Clarity sedan – and reconfigures it into a lightweight sports car design with an ultra-low center of gravity, powerful electric motor performance and zero-emissions. The design study concept is inspired by supercar levels of performance through low weight and a high-performance, electrically driven fuel cell powertrain. "The Honda FC Sport explores how to satisfy automotive performance enthusiasts in a world beyond petroleum," said Dan Bonawitz, vice president of American Honda Motor Co., Inc. "People who love sports cars will still have a reason to love in a hydrogen-powered future." The high-output Honda fuel cell powertrain and a sleek, aerodynamic body contribute to the vehicle’s performance potential. A modular approach to fuel cell component packaging and the electric drivetrain contribute to the FC Sport’s low center of gravity with the majority of vehicle mass distributed between the axles, creating the balanced weight distribution sought after in sports cars. The ideal placement of the Honda V-Flow fuel cell stack and related components demonstrates the benefits of a platform-specific, hydrogen-powered fuel cell powertrain. The FC Sport is configured to accommodate a custom-formed high-power fuel cell stack, located between the rear seats, and a battery pack placed low in the middle of the vehicle. The electric motor resides just forward of the rear axle. Two fuel storage tanks, visible from above, are located above the rear axle. The optimal placement of fuel cell components for performance also allows for a relatively large passenger cabin by conventional supercar standards with enough space for three seating positions. The interior layout focuses primarily on the driver with a racecar-like center driving position. The enclosed canopy opens upward from the rear to allow for entry and exit. Two rear passenger seats flank the driver’s left and right side. The sleek, low-profile body is designed to convey a high-technology appearance with sculpting that combines angular shapes in the front of the vehicle that taper into geometric, hex forms in the rear. The rear hex forms house cooling radiators for the fuel cell. Formula 1-style barge boards behind the front wheels enhance high speed aerodynamics and convey the vehicle’s racing pedigree. The hydrogen storage tanks, visible from the rear deck, showcase the FC Sports fuel cell technology in much the same way that a "naked bike" motorcycle showcases its engineering technology. The glacier white body color conveys the FC Sport’s clean environmental aspirations while the dark wheels and deeply tinted glass provide a symbolic contrast befitting of the vehicle’s unique combination of clean power and high performance. Green construction techniques further contribute to a reduced carbon footprint. An organic, bio-structure theme is carried through to the body construction where exterior panels are intended to use plant-derived bio-plastics. 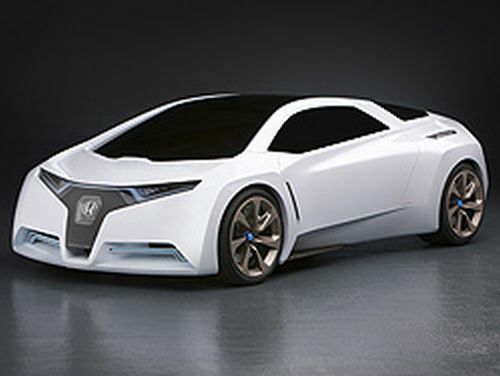 The Advanced Design Studio of Honda R&D Americas, in Pasadena, California, developed the FC Sport design study with the primary objective of using existing fuel cell technology as the basis for an ultimate Honda sports car. Designer Jason Wilbur led the design efforts. Honda R&D Americas, Inc. began its operations in California in 1975 with local market research activities and has steadily grown its capabilities over the past 33 years to include all aspects of new vehicle design and development. Recent development efforts include trend-setting products such as the Honda Pilot, Ridgeline, Element, Civic Coupe and Civic Si. In 2008, the company opened two new design centers in Southern California: the Acura Design Studio (Torrance), for the research and design of new Acura products; and the Advanced Design Studio (Pasadena), for the exploration and development of advanced design themes for both Honda and Acura.